The Bartol Mag-Probe will separate electrical from mechanical problems in seconds. Great instrument for trouble shooting electrical systems with automobile solenoid valves, pcm’s, relays and coils. The Mag-Probe can be used in any environment. It can be used in Clean Rooms, Explosive environments, Underwater, and temperatures ranging from -80°F to 180° F, in a Vacuum. It can also be used on some of the smallest relays generating a 1 gauss Magnetic field. It can be use on the largest solenoid valves using the de-sensitizing shield to block over lapping fields. It has a shelf life of 10 years and will identify North and South Poles on any magnet. It also comes with a test magnet to make sure the tester is working correctly. There are unlimited applications for the Mag-Probe. When the light comes on you know you have the presence of voltage, continuity, and current. It will work while equipment is operational, safety permitting. Great for quickly determining which direction to go in when you are trouble shooting electrical coils, automobile solenoid valves, relays and/or anything that has an electrically energized coil or winding. 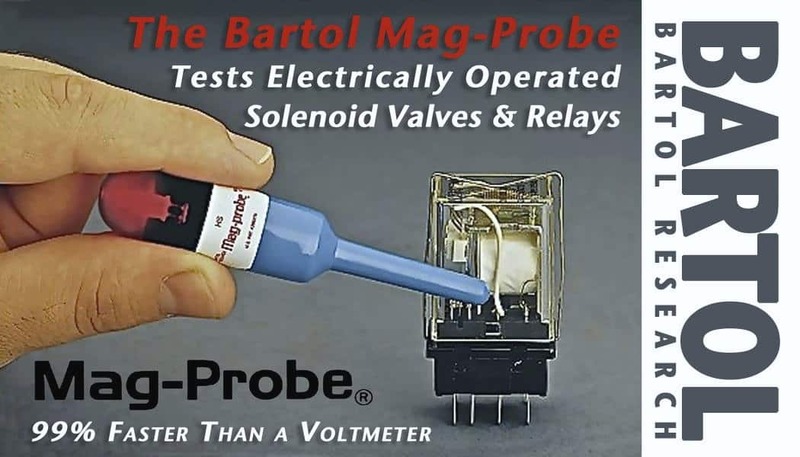 The Bartol Mag-Probe Youtube Channel explains how the Bartol MagProbe separates Electrical from mechanical problems in seconds. We discuss all the different applications of the Bartol MagProbe and the amount of time it saves the technicians in different environments. The MagProbe will allow many of the MagProbe users to get their money back on the first test.